Mariana Mazzucato opens her new book, The Value of Everything, with an ironic reminder from Plato’s Republic: “Our first business is to supervise the production of stories and choose those we think suitable and reject the rest.” She is acknowledging the way that much of our society is, as George Soros reminds us, reflexive, shaped by ideas that become true or false as we are persuaded to believe them, and also pointing out that as a result, controlling the stories we are told is a prime instrument of power. One of those mind-shaping stories is about the source of value in the economy—where it comes from, who produces it, and who should get the benefits. It’s easy, Mazzucato argues, to believe the stories we have been told are simply true, and to no longer question them. And question them we must, because the stories that rule our economy today are often wrong and, at best, incomplete. So, we must ask why we have been led to believe by our modern economic accounting that the owners of capital are the primary value creators in our society, deserving of the greatest part of the fruits of increased productivity; that government by definition is outside “the production boundary” (that is, does not create any value but simply redistributes it or consumes it); and that unpaid household labor, too, creates no economic value. Are these stories correct, or merely self-serving? Mazzucato spends much of the first part of her book giving a master class on the historical struggle to define value and its curious absence from the discussion in modern economics. That this economic framework leaves out much of what makes human life worth living is obvious to most of us. But that’s not the primary focus of Mazzucato’s critique. She takes aim instead at the legitimization of financial rent extraction by this model. Part and parcel of this modern theory of value is the idea that value creators are entitled to whatever they can extract from the rest of society. The wizards of Wall Street who brought us the 2008 financial crisis were, by this new definition, creating value even when knowingly selling defective mortgage securities, as long as they were able to find willing buyers for their goods. In 2009, with the world economy in tatters, Goldman Sachs CEO Lloyd Blankfein was able to say with a straight face that his employees were the most productive in the world. Pharma pricing, too, comes in for a drubbing in Mazzucato’s book. If price determines value, it is perfectly legitimate for a drug company to charge whatever the market will bear. After all, proponents argue, the cost of a drug should not be based on what it took to produce it, but on what it is worth to someone suffering from the condition it alleviates. Mazzucato does not find this argument persuasive. Picking up on themes from her earlier book, The Entrepreneurial State, she points out that far more of the costs of the research on which new drugs are based have been borne by the public in the form of government-funded R&D. The so-called investors have come in only when government has taken most of the risks. Yet, because of our distorted theory of value, government gets no credit, and companies that have brought relatively little to the table reap outsized returns. Mazzucato deeply questions the idea, widespread in modern Western societies and embedded in the very definition of GDP, that government does not in itself produce value. She makes the case that mission-driven government investment has created many of the marvels of the modern world, and it is only the oddity of our beliefs about value that keeps government from reaping the benefit on behalf of the public that footed the bill. In a recent email conversation with me on the need to rethink the deal between private and public investors, Mazzucato wrote, “If the public sector is a co-creator of wealth and not just a redistributor or enabler, then why does it not get a return for its risk-taking? That return could come in different forms, from conditions on reinvestment (to prevent hoarding and financialization) to conditions on the structure of intellectual property rights (less strong and wide) to equity in downstream investments.” She pointed out that Tesla and Solyndra got virtually the same amount in government-guaranteed loans, but while the taxpayer picked up the loss for Solyndra, they did not get any upside from Tesla. The price per share went from $9 when Tesla took out the loan in 2009 to $90 when it was paid back in 2013—yet the deal the government struck only allowed them to get three million shares if the loan was not paid back (that is, because the company was failing.) No private investor would take such a bad deal! While there are those who argue the government gets its return via future tax receipts and downstream economic spillovers, I agree with Mazzucato that any story in which losses belong to the government, but any gains belong to the private sector “value creators” is one of those self-serving stories Plato advised those in power to tell. From Mazzucato’s perspective, equating price and value has real-world consequences for lower economic productivity. The modern economy is rife with economic rents, particularly those imposed by the financial industry, but also various forms of government-granted monopolies, the hereditary accumulation of control over scarce resources, or outright use of force. The modern idea that rents are simply an “imperfection”, a barrier that can be competed away, has replaced the classical economic idea of rent as unearned income—that is, income received from unproductive activities is treated as equivalent to that derived from the production of real value. In the spirit of adding to the debate, I would make the case that rethinking the relative role of industries such as finance or pharma versus government as value creators is only the beginning. While Mazzucato gives a nod to the absence of household labor and what we now call the caring economy from our economic accounting, the book would benefit from a clarion call for putting these squarely inside the production boundary. 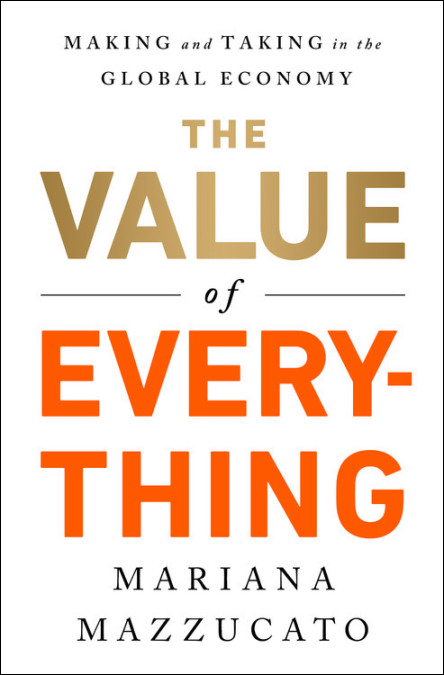 In each of the past debates about value, more and more human activity came to be understood as value creating not just because economists persuaded us of the new idea, but because of changes in society itself. The ideas of the 18th-century physiocrats made sense in a world where people rarely moved far from their homes, and land and agriculture were the principal sources of value. As the economy became less local, it was much easier to see that without the productive benefit of trade and all the services that make it possible, agricultural produce might rot in the field for lack of distribution, or never be grown in the first place. As the industrial revolution provided more and better goods, how could we not recognize industry as a kind of productivity? And as finance and debt allowed for the acceleration not just of production but of consumption, thereby enabling faster circulation within the economy, how could we fail to recognize some productive role for finance? So, too, it seems to me, that as machines make the production of the necessities of life less expensive, humanity has the opportunity for greater leisure. Though Mazzucato largely omits this from her history, at some point we allowed entertainment within the production boundary. How did we get from the point where Adam Smith specifically called out opera singers and dancers as examples of unproductive members of society to one in which we think of our creative industries as major contributors to the economy, yet still fail to recognize our mothers, our teachers, our caregivers, those family members who clean our homes or put dinner on the table, as productive? As we progress further into the age of intelligent machines, able to do more and more of even the routine cognitive labor that makes up much of the modern economy, we will clearly need to confront this curious gap in our economic accounting. In his fascinating new book AI Superpowers, Kai Fu Lee, China's leading AI investor, looks at the future of work question and makes the case that we need to look not to solutions like universal basic income, but instead at a "Social Investment Stipend" that pays people to invest time in other people, in their community, and in the environment. To use Mazzucato’s language, this would be to put the caring economy inside the production boundary. Yet another area Mazzucato points out as needing further elucidation is how we deal with “activities that appear to add value to the economy but whose output is not priced.” How might we measure the value exchange between platforms like Google, Facebook, and YouTube and their users? How might we measure the value of free and open source software? While economists have developed workarounds to include these kinds of services in the national accounts, it seems to me that these are the equivalent of the epicycles of Ptolemaic astronomy, increasingly contorted attempts to work around the failings of the underlying theory. I am intrigued by signs that we are entering a new kind of economy that runs in parallel with the money economy measured by economists. For example, in economic theory, price signaling is the primary coordinator of the market's "invisible hand, yet Google search is a massive information market in which price plays no role. The matching market of information producers and consumers is coordinated by hundreds of other algorithmically collated information signals. There is a parallel priced market (for advertising) that runs as a kind of sidecar on the search market itself, and that provides Google’s enormous profits. But how are we to measure the value exchange in the primary search market? In some cases, content is produced precisely to drive advertising. In other cases, the content is produced to drive transactions. But vast amounts of it are produced and consumed merely for the joy of producing and consuming, an economy of abundance that reminds us that what is bought and sold is not all that humans exchange. In this critique, she follows in the footsteps of earlier economists, who see economic rents as the primary enemies of equitable value distribution. In an on-stage conversation at Bloomberg last week, she remarked to me: “Most of the people who like to cite Adam Smith have obviously never read him. For him, the ‘free market’ did not mean ‘free of government regulation.’ It meant ‘free of rents’, and he recognized that one of the jobs of government is to keep the market that way.” Of course, as she notes in the book, government is currently doing a poor job of maintaining a market free of rents, precisely because our current definition of “value” allows rent-seekers free rein. Figure 2. 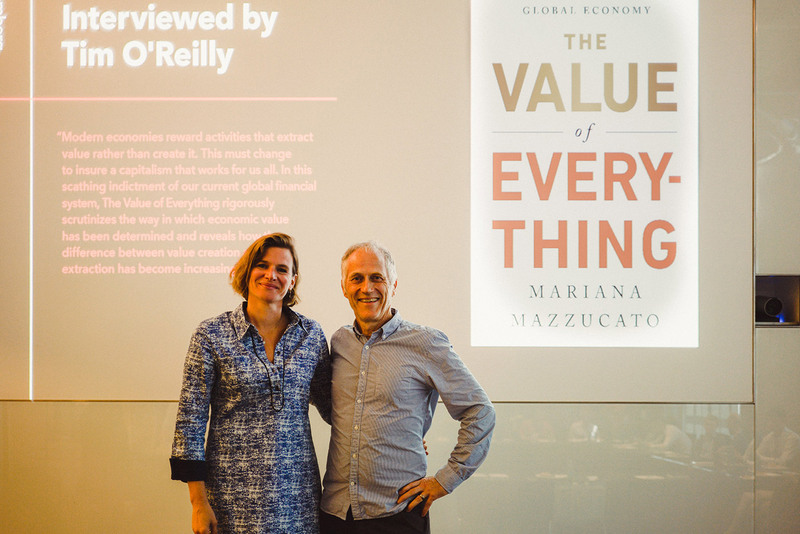 Mariana Mazzucato and Tim O'Reilly at Bloomberg. Image: O'Reilly Media. “The 'banking problem' arose,” she writes, “because as the 20th century progressed, banks’ role in fueling economic development steadily diminished in theory and practice—while their success in generating revenue and profit, through operations paid for by households, firms, and governments, steadily increased.” As Mazzucato notes, very little business investment today is provided by banks; far from being an enabler of economic activity, they have become net value extractors. Said more pungently, venture capitalist and economist Bill Janeway once explained to me that at some point banks stopped serving their customers and started trading against them. I would have also liked to see further discussion of the way that finance is different from what I call the traditional “Adam Smith market” of goods and services traded among people and firms, and has become something profoundly different—a betting market. Janeway’s fascinating book Doing Capitalism in the Innovation Economy tackles this problem by describing the economy as a “three-player game” between government, “the market” (that is, the Adam Smith-style market that I describe above), and financial capitalism, which is a futures betting market on the other two. The debate over which parts of banking belong in the traditional economy and which are part of an entirely new virtualized betting economy independent of traditional market fundamentals needs much further thought. The recognition that we use the term “the market” for two very different things would be a useful addition to the discussion. In both popular and scholarly discussions (including occasionally in Mazzucato’s book), we see this confusion between stock market value and the size and profitability of a business in the real economy. We constantly see references to the "size" of companies as their market capitalization, not their revenues, their profits, their number of employees, or other real-world factors. For example, when people refer to Uber as a “$60 billion dollar company,” they are referring to the betting odds, expressed in dollars, as to its market “worth.” Meanwhile, Uber currently has approximately $10 billion in revenue, on which it earns zero—or to be more exact, loses billions of dollars. So the financial market bet is completely at variance with the current reality in the market of actual goods and services. In the best case, this betting market brings previously unimaginable new futures into being. In the worst case, though, it is a bet on future value extraction via the establishment of economic rents, not on true value creation! In my own book, WTF? What’s the Future and Why It’s Up to Us, I call this special betting economy currency “supermoney.” In Silicon Valley, too often a company must be understood not as a producer of goods and services, but as a financial instrument, designed to get funding, perhaps to win attention and popularity and get acquired or go public based on hope and enthusiasm, but perhaps never be a working business. This special currency allows highly valued companies to pay their employees more, acquire other companies cheaply, and often create enormous wealth for their investors and the early-stage employees, who are now increasingly able to cash in on the company long before it has attained any real profits. They may have disrupted and destroyed existing businesses that make money the old fashioned way, inflated the value of local real estate, and created other economic damage. Financing entrepreneurial risk-taking is a socially productive use of finance; financing entrepreneurial theater for the benefit of gullible investors while allowing insiders to take profits off the table before the economic outcome is clear is another version of the financial market game of socializing losses and privatizing gains. The value of a company’s stock is, in theory, the net present value of a stream of its future profits–what would it be worth to own that company over time? Because the future is not certain, the price of a stock is essentially a bet on the company’s future growth and earnings. Benjamin Graham, the father of value investing, that now rare practice of which Warren Buffett is the leading practitioner, explained this concept by saying that in the short run, the market is like a voting machine, but in the long run, the market is like a weighing machine. But what happens when companies are valued on growth alone, and never expected to produce actual profits (i.e., a productive surplus)? This is akin to a horse race where bets are settled before the race has finished being run. The financial betting economy and the real economy of goods and services become radically disconnected. But more importantly, I describe our financial markets as the first rogue AI, hostile to humanity, much like the rogue paperclip maximizer in Nick Bostrom’s Superintelligence. When we optimize for the financial betting markets, humans are a cost to be eliminated, because increased corporate profits drive huge multiples in the betting markets where wealth is being extracted. The economy we want to build must recognize increasing the value to and for humans as the goal. To build that economy, we need a strenuous engagement with the questions Mariana Mazzucato asks in this book, an engagement deeply informed by the history of economic thought and how we got where we are today. I found this book enormously stimulating. You will, too. Highly recommended. Article image: "The Wealth of the Nation" by Seymour Fogel (source: Voice of America on Wikimedia Commons).